U.S. equities managed to stage a comeback from their session lows on Friday after Steve Bannon, one of President Donald Trump's top advisors, left the administration. Traders at the New York Stock Exchange literally cheered the news that Bannon was out of the administration. The Dow and the S&P fell 0.8 percent and 0.7 percent for the week, respectively, marking their first two-week losing streak since May. The Nasdaq, meanwhile, posted a four-week losing streak, its longest of the year. In Europe, stocks extended their declines after a horrific terrorist attack in Barcelona added to unease about U.S. policy paralysis and lingering tensions over North Korea. Tension between Bannon and other top advisors to Trump, including Chief Economic Advisor Gary Cohn and National Security Advisor H.R. McMaster, had been intensifying inside the White House. On Wednesday, Reuters reported that disagreement between Bannon and McMaster is destabilizing Trump's team. As volatility picked up this week with the VIX rallying roughly 44% from its lows only a month ago, investors grew worried that Trump's economic agenda, which includes tax reform and fiscal stimulus, will not get through Congress. These concerns only grew as backlash multiplied from Trump's remarks following the violent protests in Charlottesville, VA. This led to Trump dissolving two CEO advisory forums, one of which included JPMorgan Chase's Jamie Dimon. Rumors also started circulating Thursday that Cohn, Trump's top economic advisor, could resign amid the fallout. Investors pulled $1.3 billion from equity funds in the week ending Aug. 16 as tensions over the Korean peninsula escalated, according to EPFR Global data. Outflows from U.S. stock funds were triple that, suggesting a growing risk off attitude. Largely lost in the debate over how much credit President Donald Trump should or should not get for the performance of U.S. stocks this year is that perhaps the biggest reason for the rally is strong earnings. With more than 90 percent of the S&P 500 members having reported second-quarter results, earnings growth is tracking at a 12.2 percent pace year-over-year, much better than the 8.4 percent expected, according to Bloomberg Intelligence. All sectors of the benchmark are on pace to beat projections, except energy, where less than 40 percent of companies topped earnings forecasts. Technology and healthcare continue to lead upside surprises, with more than 85 percent of tech companies and 75 percent of health companies posting better-than-expected earnings per share. This is all great news yet markets are forward looking, so it stands to reason that what happens next in earnings should have a big influence on the direction of stocks. That’s where things may be looking a bit less tremendous. Despite the positive earnings surprises in second-quarter results, S&P 500 profit estimates for the next four quarters continue to edge lower. Earnings per share forecasts for the index through mid-2018 have been reduced by 0.7 percent since the end of June, with the fourth-quarter bearing the brunt of downward revisions, according to Bloomberg Intelligence. But should this worry the prudent long-term investor? At the sector level, the Information Technology sector is expected to be the largest contributor to earnings and revenue growth in 2017. No wonder the Russel 2000 is up a measly 0.05% YTD while the Dow is up 9.67% and the S&P 500 is up 8.33%. Absent any significant changes in foreign exchange rates and global GDP growth in the second half of 2017 which could alter these expected earnings and revenue growth rates for the full year, it is unlikely that David Tepper’s bold call that technology stocks "look cheaper than any other part of the market even though they moved” will prove foolish. So what are the opportunities? Well, we have spotted one such opportunity that recently took a dive after an earnings miss: Priceline Group Inc. (NASDAQ: PCLN). This online travel reservation business has been growing pre-tax earnings over the last decade at a compound annual rate of 42% per year. That is faster than Apple, Amazon, Netflix, Alphabet and Expedia (Expedia has been growing EBITDA over the last decade at around 7%). Average ROE is about 28.4% and long-term prospects also look favorable. Last year travel accounted for roughly 10% of global GDP or $7.6 trillion and only about ⅓ of it is booked online. This share is expected to grow by a few percentage points per year and thus although rivals such as AirBnB, Tripadvisor, Expedia, Ctrip and perhaps Google are circling, the future looks bright indeed. Sitting roughly 12% off its 52 week high Priceline is getting attractive. A move under 1600 or another 12% down from current levels and we would look to initiate a position. Came across a pretty interesting chart this week from Michael Batnick which painted a nice picture of how the market has scaled the “wall of worry” in defiance of a plethora of doomsday predictions of an imminent selloff. As the graph shows, since stocks bottomed in March 2009, the S&P 500 index has soared 271% to multiple records, meandering higher through the European debt crisis, Brexit, and the U.S. presidential election. Political upheaval certainly does not necessarily translate to market volatility. But more importantly, the chart got me thinking about a common refrain these days: “things can’t keep going up like this”. Is that true? Are “things” bound to collapse? What may be more relevant to consider is what we mean by “things”? Looking at this current market as a "market of stocks" rather than as a "stock market" it is clear that “things” most certainly cannot keep going up and in fact “things” most certainly are not continuously going up: The average Russell 2000 stock is already in a bear market, falling 22.42% from its 52-week high. The median Russell 2000 stock is 17.38% from its 52-week high. Likewise, the average and median S&P 500 stock are 8.04% and 11.77% from their 52-week highs. 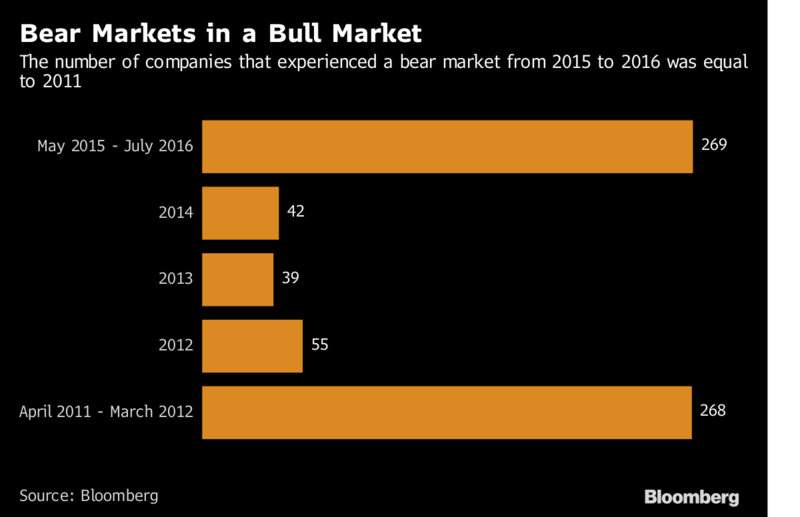 What of this record bull market then? Well it may be that we have experienced several “stealth” bear markets within the current long-term uptrend. It should be remembered that market crashes of over 30% are incredibly rare events. Could the bear market that so many people are predicting these days have already happened? Ten years ago from August 9, people weren’t that worried about impending financial doom. Ten years ago August 9, all was not well with the global financial system. On Aug. 9, 2007 BNP Paribas froze more than $2 billion in funds, barring investors from withdrawing their money due to a “complete evaporation of liquidity in certain market segments.” This marked the beginning of a dangerous new phase in what eventually developed into the worst economic downturn since the Great Depression. What did we learn? Reuters puts together a decade in charts. Financial Times suggests that there were clear warnings that Wall Street ignored. Time to focus on return of capital strategies? Is there anybody left recommending risk assets? It sure seems like if there are, they are few and far between. The number of influential pundits warning about the risk of investing in assets such as corporate bonds and equities is growing exponentially. Recently it was Oaktree Capital Group co-Chairman Howard Marks and former Federal Reserve Chairman Alan Greenspan. Last week, it was the likes of DoubleLine Capital Chief Executive Officer Jeffrey Gundlach, HSBC Holdings’ head of fixed-income research Steven Major and Pantheon Macroeconomics Chief Economist Ian Shepherdson. Have we reached the point in the investment cycle where you’ve got to start thinking the return on capital is rather less important than the return of capital…Luckily for doomsday preppers, the end of the world is good for business. Is passive investing “devouring capitalism”? Billionaire Paul Singer is warning of a growing and menacing threat: passive investing.“Passive investing is in danger of devouring capitalism,” Singer wrote in his firm’s second-quarter letter dated July 27. “What may have been a clever idea in its infancy has grown into a blob which is destructive to the growth-creating and consensus-building prospects of free market capitalism.” Almost $500 billion flowed from active to passive funds in the first half of 2017. The founder of Elliott Management Corp. contends that passive strategies, which buy a variety of securities to match the overall performance of an index, aren’t truly "investing" and that index fund providers don’t have incentive to push companies to change for the better and create shareholder value. Cranky underperforming manager (Singer’s Elliott Associates fund rose 0.4 percent in the second quarter, bringing gains for the first half to 3.5 percent) or luminary? The Atlantic explores the growing chorus of experts that argue that index funds are strangling the economy. I would agree. Diversification has brought undeniable benefits to large numbers of Americans. If recent scholarship is right, it has brought hidden costs to many more. For the opposing view see Gadfly. Forget robots — “super-workers” may be coming for your job. According to a report from PwC, one outcome of technology and automation could be the rise of the medically-enhanced “super-worker” by 2030. These workers will combine man, machine, and medical enhancements (like pharmaceuticals to boost cognition) to secure employment and guarantee performance in an increasingly competitive labor market. 70% of those surveyed by PwC said they’d undergo treatments to improve their bodies and minds if it would help their job chances. On a small scale, some of this is already happening: A Wisconsin firm recently made headlines for microchipping employees. Lego-Like brain balls could build a living replica of your brain. The human brain is routinely described as the most complex object in the known universe. It might therefore seem unlikely that pea-size blobs of brain cells growing in laboratory dishes could be more than fleetingly useful to neuroscientists. Nevertheless, many investigators are now excitedly cultivating these curious biological systems, formally called cerebral organoids and less formally known as mini-brains. With organoids, researchers can run experiments on how living human brains develop—experiments that would be impossible (or unthinkable) with the real thing. Digging for digital gold in Inner Mongolia. The crypto currency mania shows no sign of abating. Consider the case for $5000 bitcoin (why not $10000?). Yet also consider that at the heart of bitcoin are miners running massive computing operations to earn the $7 million up for grabs each day for solving complex mathematical equations. Zheping Huang and Joon Ian Wong got access to one of the world’s largest bitcoin mines, Bitmain, and offer a rare look at the lives of its workers, as does a photo essay for Quartz by Aurelien Foucault. I see bitcoin as here to stay. Perhaps grandpa had a pension and this generation has cryptocurrency. Great piece in the New York Times suggesting that “as traditional paths to upper-middle-class stability are being blocked by debt, exorbitant housing costs and a shaky job market, these investors view cryptocurrency not only as a hedge against another Dow Jones crash, but also as the most rational — and even utopian — means of investing their money."